This past November Jamba Juice made a bold move, bringing in a new CMO with a 20-year track record of marketing innovation and success. Claudia Schaefer has worked on the client side with such brands as Cheddar's Casual Cafe, Brinker International, and TGI Fridays, and on the agency side with Leo Burnett. No matter the address, Schaefer has successfully led departments and developed an expertise and reputation for marketing, innovation, and business development. 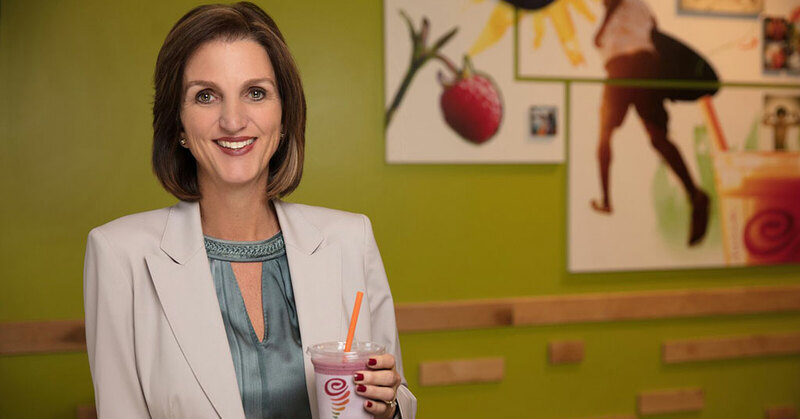 In her new role at Jamba Juice Schaefer oversees all aspects of global marketing, consumer insights, public relations, product innovation, and research and development for the brand's more than 800 company-owned and franchised locations worldwide. "With our loyal customer base, premium product, and high brand recognition, I see an amazing opportunity to reimagine this legacy brand and redefine what it means to consumers today," says Schaefer. "I'm passionate about healthful living and am excited to work for a brand that's appreciated for inspiring and simplifying a healthy lifestyle through high quality, hand-crafted blends and meal replacements." Here she shares more about her team, how the brand's departments work together, and the challenges and opportunities she sees the brand facing as it looks ahead. I lead brand marketing and innovation. My priority is to grow sales while redefining Jamba's brand positioning through a consumer data and insights-driven approach. What's unique about the CMO position at Jamba Juice? Jamba is an iconic global brand with a footprint of more than 800 stores and over 25 years of history. With our loyal customer base, premium product, and high brand recognition, I see an amazing opportunity to reimagine this legacy brand and redefine what it means to consumers today. Additionally, Jamba moved its headquarters from California to Texas in October 2016, so most of my team has been with Jamba for just over a year. Since we are all relatively new, we are learning the ropes together while laying the groundwork for the future. One of today's challenges as a CMO is being able to find the perfect balance and methodology in driving sales and transactions for the short term, while revolutionizing the brand for the long term. 1) Being consumer insights-driven: it is imperative to know who your current consumer is and who your potential consumer could be. 2) Being data-driven: to fully recognize and capitalize on the brand's opportunities, and mine and understand the data. 3) Connecting the company to the data: for the company to be focused on the same goal, it is imperative that each team member understands and aligns with the data and results from consumer insights. We begin with an annual marketing calendar that outlines the high-level plan for the year. Our marketing team develops four to five campaigns each year. For every campaign, we use a collaborative and consumer data-driven process designed to anticipate trends and understand the void in the consumer need state. We then determine how Jamba can support the demand through product innovation and an integrated marketing strategy that will drive sales while continuing to build an iconic brand. We use strategic KPIs depending on the channel and initiative. For a new item rollout, we may look at the product mix and units per day to gauge traction. On social media, we place a large focus on engagement, while also measuring impressions, share of voice, and fan growth. In public relations, we consider impressions, share of voice, and sentiment. On a higher level, we reference industry benchmarks and look for a lift in sales and traffic. How do you go about creating a customer-centric marketing and brand philosophy? We make it a priority to listen to the consumer. I have found that you will quickly understand what consumers would like from your brand if you root your approach in consumer insights and data. We have built an integrated marketing team that works in tandem with our agency partners to carry out national programs. The brand team is responsible for managing brand perception through social media and public relations. Consumer insights provides us with a quantitative and qualitative understanding of the consumer, brand, and opportunity within the industry. Marketing services handles the execution of all marketing campaigns, including strategy, creative development, production, and project management. Our digital team is responsible for all content on our website, mobile app, email, and loyalty program. Field marketing serves as the liaison to franchisees and executes all local marketing initiatives. We partner closely with the innovation team, which is responsible for developing new products that cater to ever-changing consumer needs. Our marketing team partners with the franchise development team to introduce our brand and culture to prospective franchisees throughout the franchise recruiting process. For potential owners and representatives of Jamba, it's important that prospective franchisees align with our mission to inspire and simplify healthy living, and are passionate about sharing our nutritious blends, made from nature's best ingredients and served with an infectious energy. As the front line to consumers, franchisees are responsible for carrying this on through the in-store experience. We have a team that specializes in recruiting, onboarding, and training franchisees. Our franchise recruitment team and outside partners work together to develop educational tools and assets to help prospective franchisees understand the brand and business opportunity. Our consumer insights team conducts both qualitative and quantitative research so that we can better understand our opportunities and how to optimize our products and campaigns for maximum success. With consumer insights and the latest digital capabilities, we are able to clearly understand who our consumer is, their purchasing behavior, habits, and preferences, which ultimately allows us to be targeted with our marketing approach and efficient with our investments. Social media is an integral and ever-changing platform for online marketing and communication, particularly among Millennials and Gen Z. Brands are able to carry on two-way conversations with consumers at minimal cost. This not only connects guests to the brand, it also gives the brand powerful insight into guest perception and need state. We make it a priority to engage with every guest who interacts with our brand, while proactively reaching out to inspire new or lapsed users to Jamba. Most important, we use social media as a real-time tool. We know that online trends can start and end within hours, and social media offers a way to activate quickly and create meaningful moments with followers. It's also important to use these platforms to drive business results. Social media is the fastest way to bring time-sensitive promotions and messages to market. It offers a frictionless way to drive results in real time while shaping brand perception through a collection of interactions. How are you assisting your franchisees with more contact and transparency? What are their immediate needs? We're committed to supporting and listening to our franchise partners. We've made it a priority to connect with them regularly in an effort to understand their immediate needs, challenges, goals, and recommendations. We provide communication portals to offer real-time updates and tailored training to both employees and franchisees. We host an annual franchisee conference, where all owners have an opportunity to directly connect with Jamba's leadership, share ideas, and align on organizational goals and future plans. We offer a team of passionate marketers who develop fully integrated campaigns that drive national brand awareness. Furthermore, to ensure that we are always meeting the needs of our franchisees, we assign each franchisee to a franchise business consultant who is the main point of contact and liaison within the company. We have found that working cross-departmentally is key to achieving success and unity in the planning and execution of campaign rollouts. From campaign webinars with franchisees and video meetings with our field teams, to Skype Messenger and our online training portals, technology plays an integral role in keeping departments, franchisees, and field team members aligned, on track, and connected. Absolutely. We are intentional about who we work with, as we believe they are an extension of our brand. Everything has become digitized. It is an extremely fascinating time to be a chief marketing officer, as you are able to read results immediately and are able to optimize campaigns in real time. We are able to better understand consumer behavior and quickly use this data to inform our decisions and offerings.